As I've learned more about raising chickens in the city, I've been keeping my eye on the plight of urban chickens up in Canada. After all, it was the CBC show Spark that gave us our radio debut. What's surprised me most is how unwelcome urban chickens seem to be, at least in eastern Canada (see the efforts to keep urban chickens out of Ontario or the forced movement of Hanavan's Halifax chooks). Now, there's news in the Ottawa Citizen that the tolerance for urban chickens is growing in western Canada, at least. At least thirteen municipalities in British Columbia have allowed urban chickens and if Bonnie Klohn has her way, Kamloops, BC will be joining the list soon. In Kamloops, B.C., city council is taking a careful look at the urban chicken movement. Bonnie Klohn, a 21-year-old university student, has asked Kamloops council for permission to conduct a pilot project with 32 families that want to keep urban hens. The families would take courses about hen husbandry, public safety, disease prevention and how to build a chicken coop. Each family would keep three hens for six months starting in March. Ms. Klohn says she was inspired to work in the urban hen movement by two years she spent in France, where she said municipal officials have never outlawed chicken coops and people are much more in tune with their food sources and nature. 1. Fresh, healthy, delicious eggs, free of pesticides and antibiotics. 2. Chickens eat table scrapes, reducing municipal organic waste. 3. Chickens produce a rich fertilizer by-product, high in nitrogen, eliminating the need for petrochemical fertilizers. 4. Educational - teaches children where our food comes from and demonstrates responsible pet ownership(chores). 5. 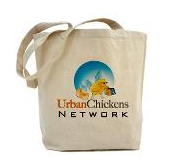 Great pets - Chickens are people-friendly. 6. Chickens eat bugs, reducing our backyard pest population. We, the undersigned, citizens of the City of Calgary, urge Calgary City Council, to update the Calgary Municipal Code in order to permit the responsible raising of backyard chickens. If you're reading this up in Alberta, please add your signature to the petition today!